There’s a reason why everything in Scotland is so green. And why the cattle and sheep seem so fat and happy. Rain. Liquid sunshine is almost a daily occurrence somewhere in Scotland. Sometimes it just showers for ten minutes and is sunny the rest of the day. Sometimes it pours so hard that only maniacs (like me) would think of playing golf. The locals get used to it. Visiting golfers have no choice but to do the same. When you’ve planned a trip to play the great links courses of Scotland, you’re not about to let a little water stop you. But that doesn’t mean you shouldn’t come prepared. A good rain suit will keep you drier and make playing in the rain a lot more enjoyable. The Sun Mountain Torrent is just such a suit. Today, our Golf Road Warriors group played in 20 mph winds and constant rain at Dunaverty Golf Club in Southend, Scotland. But the only things that were wet when I finished were my head and neck. I don’t want this to sound like a Sun Mountain commercial – but this gear is very good. The Torrent provides guaranteed waterproof protection using an amazing, new, four-way stretch-woven fabric that shields the player against wind and rain, while remaining breathable and stretching to allow an unrestricted swing. That’s a lot of good news in one sentence. The stretch fabric is key, because no matter how well a suit keeps you dry, if you can’t swing freely in it, you might as well head to the clubhouse and start sampling the single malts. The jacket’s expansion cleats in the back help with this, too. Being breathable is also important, because keeping moisture away from your body is a two-way thing; you want perspiration to move away from the body just as much as you want to keep raindrops from coming in. There’s a lot of technology in this Sun Mountain product. Its construction consists of a waterproof/breathable membrane laminate to the stretch-woven fabric; this fabric is then treated with an advanced water-repellent finish. Sewn to the interior of the fabric is a liner to protect the waterproof membrane and offer a slippery layer that won’t catch and grab on whatever you’re wearing under the suit. This is the same system Sun Mountain built into the 2011 USA Presidents Cup team’s gear. 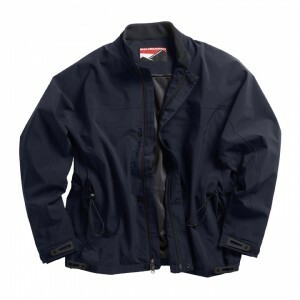 The jacket offers full-length, two-way zippers, adjustable hems and cuffs, an internal pocket to keep your souvenir scorecard in, and hand-warmer pockets on each side – something that has come in handy here in Scotland on a couple of the chillier mornings. The pants have a zipper fly, elastic waist with dual cinch adjustment, a zippered back pocket, pass-through hand-warming front pockets, snaps at each leg’s hem for easy adjustability, and lower leg zippers with full gussets that make them easy to put on and take off. I think it’s safe to say that more engineering has gone into this suit than goes into your average Italian-made car. And trust me, it all comes in very handy when you’re standing on the 5th tee at Dunaverty within 40 yards of the sea and the wind is turning each rain drop into an icy needle. In weather like Scotland’s, there’s a temptation to try to second-guess Mother Nature and only out your rain suit on when you feel the first drops. With Sun Mountain’s Torrent rain gear, you can just put it on and forget about it. It’s comfortable, gives good freedom of motion, and when the heavens open up on you, it does its job well. If you happen to get lucky enough to have a forecast of clear weather, then a good backup garment is the Sun Mountain Headwind windshirt. It’s water-resistant, stretchable, breathable, and has a nice high collar for keeping the wind from whipping down your neck. This microfiber shell is actually treated with Teflon, so when they say it’s windproof, they really mean it. Its adjustable cuffs and hand-warmer pockets are perfect for links golf conditions. I wore one all the way around Dunaverty today and stayed warm and cozy ‘til the 19th hole. Can’t ask for more than that.